If you ride a motorcycle you’ve probably already heard countless people tell you how dangerous it is, so we won’t add to that pile of negativity. We will, however, suggest that you upgrade your helmet to this awesome one from Skully. The AR-1 is an augmented reality helmet that not only gives you the protection and comfort of a regular helmet, but adds a ton of features never before seen in a motorcycle helmet. The futuristic looking helmet comes with full smartphone integration, offering a number of pretty rad features. It has visual and audio GPS navigation so you never have to pull over to look at a map. A 180-degree rear-view mirror lets you safely keep an eye on what’s happening behind you, eliminating the dangerous blind spots of other helmets. The heads-up display is voice activated, so you can control everything from music to text messages with just your voice. The helmet’s battery life is around nine hours, so unless you’re setting off on a cross-country trip you should be able to use all of its features for the entirety of your ride. 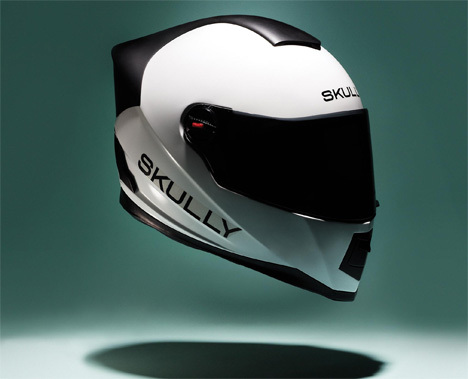 While we love the futuristic aesthetic and the many features of Skully’s cool invention, we hope it comes with a warning that it should only be used by experienced riders. For a beginner, all of the added functionality could prove to be too much distraction while on the road.